The gardens and farms of northern Tasmania have burst to life. The fields are chockers with crops; backyards are busy with the harvesting of beetroot and brassicas; the berries aren't far off; and there are paddocks completely mauve with poppies or baby blue with linseed. But, if you want a symbol of agricultural fecundity, you don't have to look much further than the Van Dieman Brewery farm in White Hills, just outside Launceston. 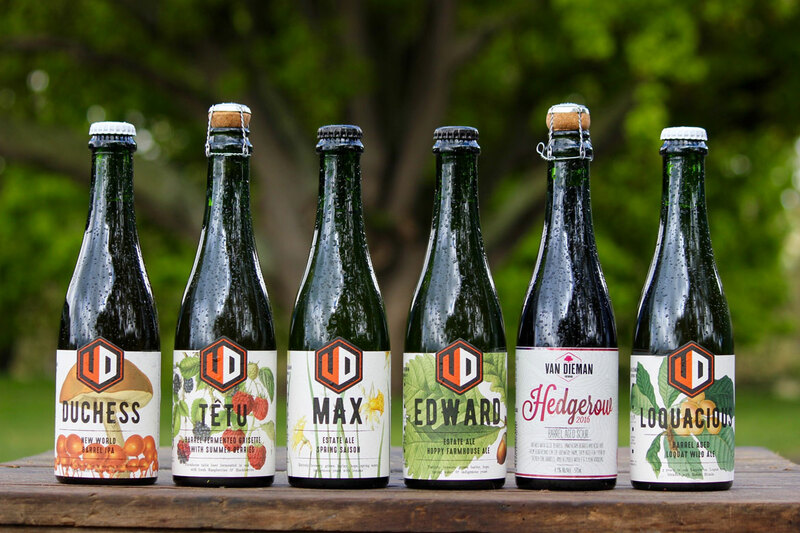 Coinciding with the onset of summer, Van Dieman's owner-brewer-farmer Will Tatchell has released six new beers – and not only do the new brews encompass fruity and farmhouse styles, but two are made from ingredients sourced entirely from his family farm. Van Dieman was one of the earliest craft breweries to establish in Tassie. Coming back home to his parents' farm after a stint brewing in the UK, Will and wife Kalie contemplated setting up a brewery in a few sites, potentially outside of Tasmania. Finally, though, Will concluded they'd do just as well repurposing part of the farm for craft beer. "When we started the brewery on the family farm, we did so not so much strategically but more opportunistically," Will says. "As we've matured and grown, our initial decision to set down roots on the farm are beginning to influence who we are and what we do." 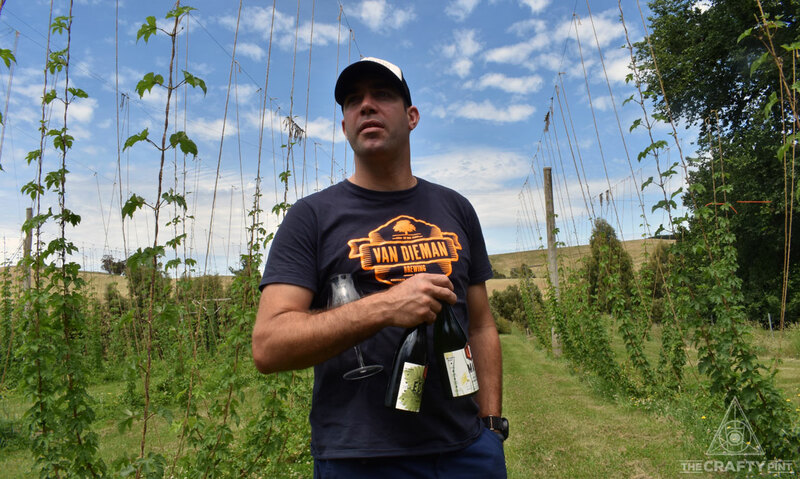 Back then, in 2009, making beers entirely sourced from the farm might have seemed a longshot, but a decade on Van Dieman has fulfilled just that. It puts the brewery among a tiny number in Australia aiming to pull off what Will refers to as "from ground to glass", with fellow Tasmanians Two Metre Tall working with hops, barley, water and yeast from its Derwent Valley farm and Rocky Ridge in the Margaret River region recently brewing a couple of its core beers with ingredients sourced on its family farm. 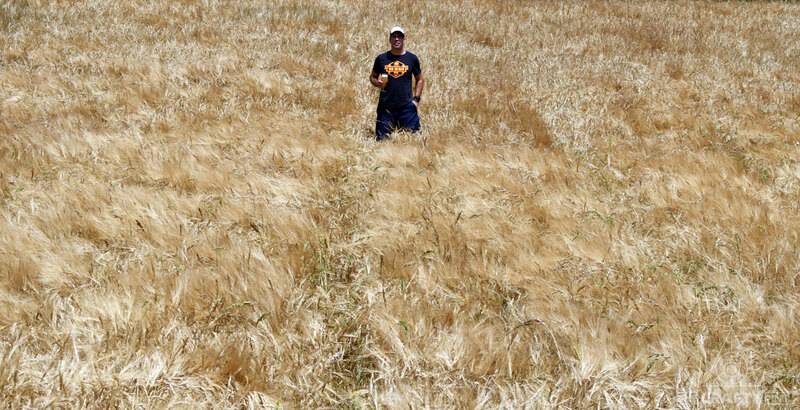 In the case of the Van Dieman beers, aside from a short trip for the homegrown barley to and from Launceston to be malted, the furthest any ingredient in the two recently-released estate ales has travelled from where it was grown to where it was brewed and botted is 435 metres. That certainly puts the concept of terroir at the forefront of their brewing. Those two beers are called Max and Edward, named after two of the Tatchell's children; next year, there will be a third beer, named after their other son, Oscar. The recipes for the two estate ales are designed to put an emphasis on their native ingredients. The hoppy farmhouse ale Edward highlights the brewery's Super Pride crop, while the lovely, fizzy saison Max is designed to showcase the farm's house yeast, established after isolating two yeast strains from a spontaneous capture at the brewery almost three years ago. "We're trying to represent and deliver 'clean' beer styles," Will explains. "We don't want to hide behind funk." Will gestures to a spot outside the brewhouse where they captured their two indigenous strains of saccharomyces yeasts. "It's been a critical component with regards to what we want to present in the bottle," he says. Part of the process of developing these beers now has been working out the interplay of the flavour profiles between their homegrown hops and yeast. This equilibrium has been attained immaculately in Max (the saison, not the child), which is also brewed with lemon rind – taken from Will's parents' orchard up the road, of course. There is, of course, a potential problem with naming beers after your kids: Max is clearly Will's favourite beer too. One hopes it doesn't give the other children a complex. "So, how do I explain to Edward and Oscar that Max is my favourite...?" Will Tatchell amid his farm's hop bines. There's also Têtu, a deliciously refreshing grisette, its secondary fermentation taking place on raspberries and blackberries. Despite the exotic nature of its creation, it's an easy-drinking summer beer, which is exactly what Van Dieman is aiming for – Will repeats the phrase "balance and drinkability" a few times during our visit – and guess that, despite the eagerness to experiment and explore the possibilities of their ingredients, making sure the brewery's creations are approachable remains a priority for one of Tassie's original craft breweries. 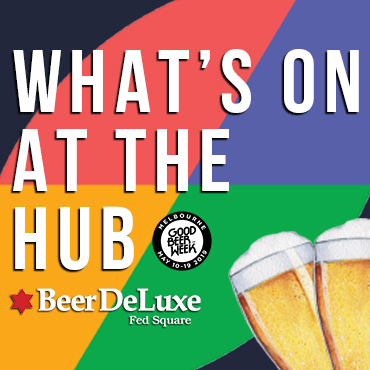 Rounding out the six new releases – all of them were launched at a restaurant in Launceston at the end of November – are the Duchess and the latest incarnation of the brewery's Hedgerow series. The former is a double IPA barrel aged with brettanomyces then dry-hopped with Galaxy and Enigma, turning it into a beer whose style is hard to pin down: it pours a delightful bright orange and carries both brett and the barrel's oakiness well. Meanwhile, the 2016 Hedgerow is a blended, Flanders red style ale featuring the farm's hawthorn berries, sloe berries and rose hips you can read about here. The full and fascinating lineup of six new beers from Van Dieman in Tasmania. It's been fascinating to watch the development of Van Dieman's beer over the years as the brewery continues to reimagine itself. 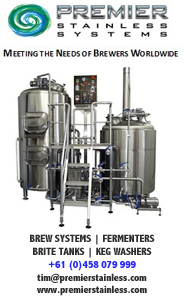 Part of its evolution could be attribute to a close collaboration with Stu Grant, who brews his Ocho beers at Van Dieman as well as working part-time for Will. During the few hours spent at White Hills on a Monday morning, these two characters form one of the more intriguing and inventive friendships you'll come across in craft beer; it's one that led the founder of this site to predict big things for the two brewing companies in an article for James Halliday's Wine Companion Magazine this time last year. There was a lively energy that morning, and it was set to be a busy day. The labels had arrived for their first collaboration beer, a coffee IPA they've produced with Sydney's Bucket Boys, and the cans for Van Dieman's first tinnies – for their popular Motor Mouth IPA – were due to be delivered. Collaboration definitely helps, but Will's stubbornness also goes a long way. "I could never work for someone else now," he grins, and when we start talking about the trajectory of craft beer in Tasmania, he quickly steps in. "It's not about craft beer. It's about independent beer." Perhaps it's just as well he has a farm that's able to produce everything he needs. And Van Dieman's independence may grow more fierce as time goes on: they're looking at creating their own 1.5 tonne pilot malting plant after using the now defunct Not For Horses micro-malting setup for the first two estate ales and, perhaps, even (after years of resisting the idea) a cellar door. Certainly, scattering sheep from the driveway while heading away from the brewery and onto the narrow backroads that lead to Launceston, it's easy to imagine returning to this bucolic setting for a couple of glasses of Van Dieman beer on a summer afternoon. A Christmas box, containing two of each of the six new releases, is available through the Van Dieman website.